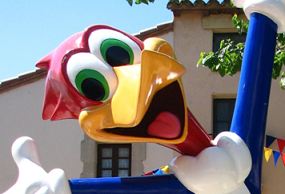 Located in Salou on the outskirts of Barcelona, PortAventura Park is divided into six themed zones, each filled with a fantastic variety of intense rides for daredevils, gentle rides for small children and middle-of-the-road rides for everyone to enjoy together. The Sesame Street zone is always a huge hit amongst children under ten where they can meet their favourite Sesame Street stars at the Magic Tree, feel like they’re flying through the sky on Waikiki and ride the Magic Fish which skims the water. Bigger kids will love the Far West zone, full of moderate rides like the Wild Buffalo bumper cars and Grand Canyon Rapids, while teens and adults will be more at home in the China zone where you’ll find Shambhala: the roller coaster with the highest drop in Europe! 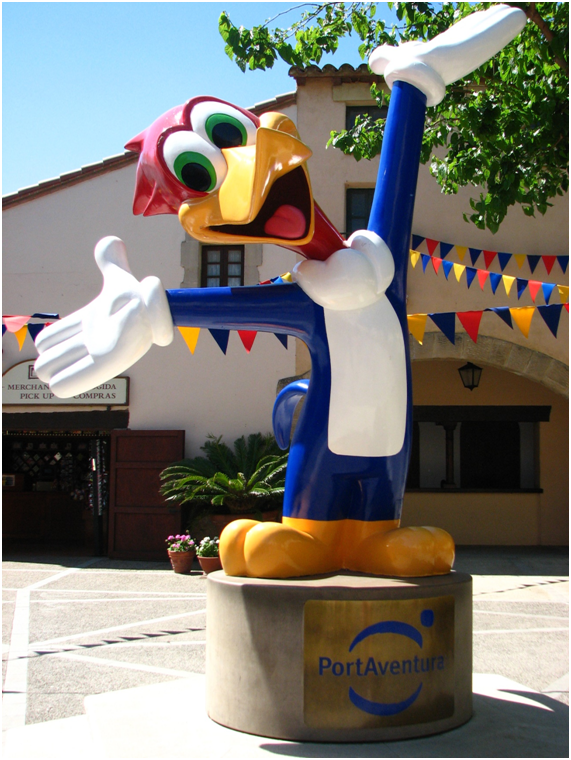 Just next door to the PortAventura Park is the PortAventura Caribe Aquatic Park: a huge water park full of swimming pools, water slides and splash zones. 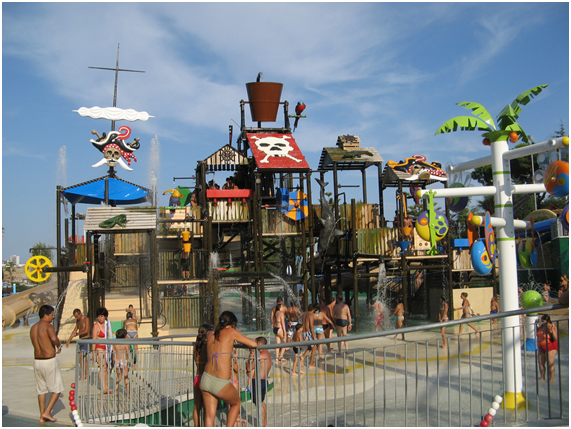 There are several special areas for very little ones, including Sesame Beach: a shallow swimming pool with constant water spouts and a surrounding solarium, and Woody’s Lagoon full of slides, water jets, taps, rope bridges and swings to keep water babies entertained for hours! For older children there’s the Bermuda Triangle: a big swimming pool where older children can bob up and down on man-made waves and the 1,500 metre-long Crazy River full of unexpected surprises. Adventure seekers won’t be able to get enough of King Khajuna which reaches speeds of 6 m/s or the fast-paced Typhoon which snakes around in constant loops. 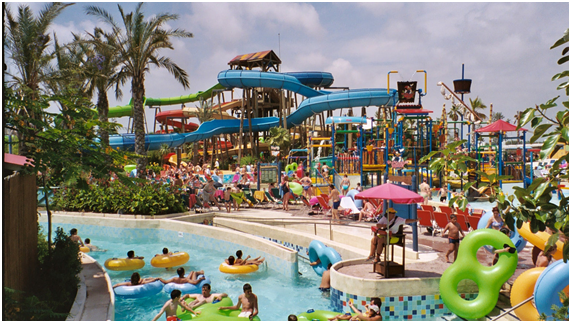 Set close to the coast around a 30-minute drive north of Barcelona, Illa Fantasia Water Park is home to more than 22 water slides, three swimming pools and a big picnic zone complete with barbecue facilities for a delicious al fresco lunch. There are loads of calm slides for children, including the Jumping slide which bumps up and down to simulate waves and the flat, wide Minitous slides which splash into a shallow swimming pool below. More adventurous children will have great fun with the Spiral: a ten metre tall corkscrew tube slide and the Multipista where you can race friends and family to the pool at the bottom. For an action-packed experience, there are the Kamikaze slides which see those brave enough shoot through tunnels at speeds of up to 60 km/h and the Crazy River where high-speed heart-pumping sections mingle with chilled out, relaxed areas.